The entirety of Dark Shadows' budget must have gone to Tim Burton's Verizon bill because he totally phoned it in. 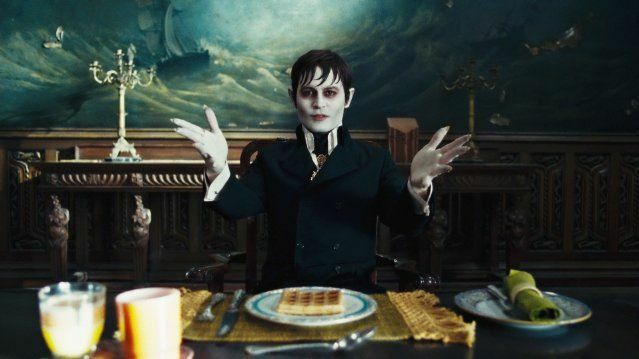 The latest patented crazy costume/goofy accent love fest between Burton and his manly muse Johnny Depp is a visually sumptuous but lackadaisical affair where Depp plays Barnabas Collins, a vampyre buried alive (er, undead-alive) in the 1760s and resurfaces in 1972. A bona fide family man, Barnabas must reestablish himself as the paterfamilias to the descendants of his line, his great great great -- whatever -- there's Michelle Pfeiffer, Chloe Grace Moretz, Jonny Lee Miller, and, because this is a Tim Burton Joint, there's also Helena Bonham Carter, who is of no relation to anyone in the Collins clan but lives in their giant gothic mansion anyway. How Barnabas, who was unlucky (to say the least) in love and never sired any children before becoming a vampire, even has descendants is a question Dark Shadows avoids like a vampire avoids direct contact with sunlight. Two amusing runners of Deppula trying to find a comfortable place to sleep (sometimes upside down) and anachronism jokes of this old-timey bloodsucker out of place in the culture of the Me Decade fleetingly distract from what Dark Shadows is really about: two immortal entities trying to control the fishing business of their sleepy town in Maine. The other immortal is Eva Green, a slinky, snarling witch who wants Depp's loins but cursed him to vampirism and then spent two centuries grinding the Collins family under her proverbial heel. Speaking of snarling, Moretz keeps her lips in a perpetual curl and speaks in a constant rasp: by this point in her young acting career, she has now played every monster archetype in the Twilight franchise (she was much better -- than Depp, even -- when she played a vampire in a much better film). All is resolved in a special effects action set piece where the Collins clan is basically revealed to be the Munsters. The kids of today should defend themselves against the vampire soap opera remakes of the 70s. Mike Watt references always appreciated.